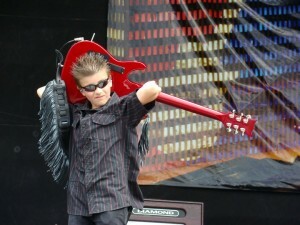 Just when you think you have seen everything along comes a 10 year old guitarist that blows your socks off! This kid not only can play but with the help of his fans and promoters is challenging the laws of the land in Wisconsin who restricts the rights of minor performers to play in certain establishments due to liquor laws. 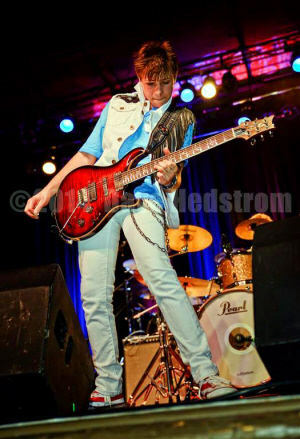 Talan will amaze you with his Jimmy Hendrix abilities and will keep the major news media busy following this zealous performer that deserves to be heard! Watch Tallan Performs and talk about his career! 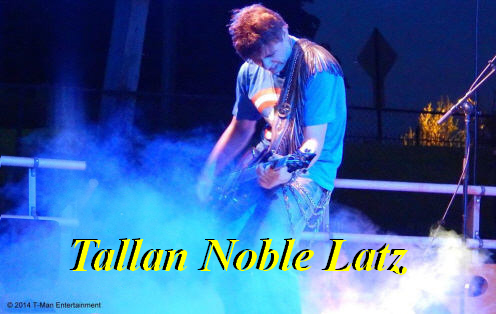 It’s been some time since Tallan Noble Latz was featured here at Rivenmaster’s Place. In fact four years since his “Blues in Tennis Shoes” article published. While he has appeared three times since that first article, it’s been far too long since we have been able to bring you a full update regarding T-Man’s musical adventures and accomplishments. Tallan, who just turned 15, stays extremely busy performing at festivals, performing arts centers and theaters across the Midwest. Tallan has also been headlining many charity events raising awareness and money for a number of organizations! During the past four years Tallan has been honing his craft, working harder than ever to define his sound and guitar skills, and most importantly working on his stage presence. Tallan’s performances have been dubbed a “Must See, One of a Kind” concert event! To maintain that status, Tallan always gives 110% at every performance which is the reason his reputation is spreading so rapidly. Tallan’s musical direction in the last few years has evolved from Blues to a more roots Rock, guitar driven sound. Tallan calls his music, guitar driven blues infused progressive rock and roll. This evolution has come very naturally to Tallan and everyday he evolves more and more into his own style and sound. Tallan has worked hard to become the package that concert goers want to see. This has been made evident by Tallan being handpicked to open for many big name artists. He has had the opportunity lately to open for bands such as: Kenny Wayne Shepherd at Buddy Guy’s in Chicago, IL; The Los Lonely Boys at the Arcada Theater in St. Charles, IL. He’s even been selected to open for some musical legends like BB King at the Bloomington Center for the Performing Arts in Bloomington, IL. In addition, Tallan opened for a legend that is no longer with us, Johnny Winter at Turner Hall in Milwaukee, WI, just a month before he passed. Of all the talent that I’m privileged to write about I especially enjoy keeping you up to date about my young friend Tallan Latz! 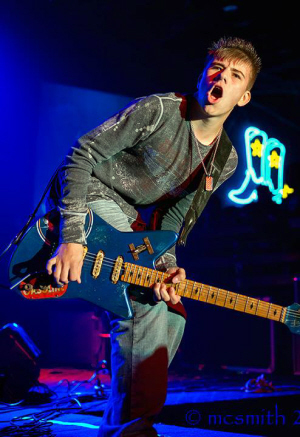 Tallan is not only an exceptionally talented musician and guitarist but also a great young personality who is able to jam with some of the biggest and best blues guitarists in the music industry. Tallan lights up a stage just by being there, but when he starts to play you have to stand back in amazement that this youngster not only can perform but make sounds come from his instrument that only the most knowledgeable and skilled artists can match or keep up to. I so much enjoy watching the pros faces when they watch and play along with Tallan! Chord for chord and riff for riff…..
It’s been a long time since my last update for Tallan and every day the searches for him continue to climb here on Rivenmaster’s Place! Readers young and old are hunting for new tidbits about this amazing blues wonder! I have not written, only because Tallan has been so very busy. Since my last writing, Tallan has been doing many concerts, shows, and events such as the one held back in September.